The borough of Ipswich sprawls now far beyond its official limits, but there are still places within a couple of miles of the Cornhill that feel like proper Suffolk villages. 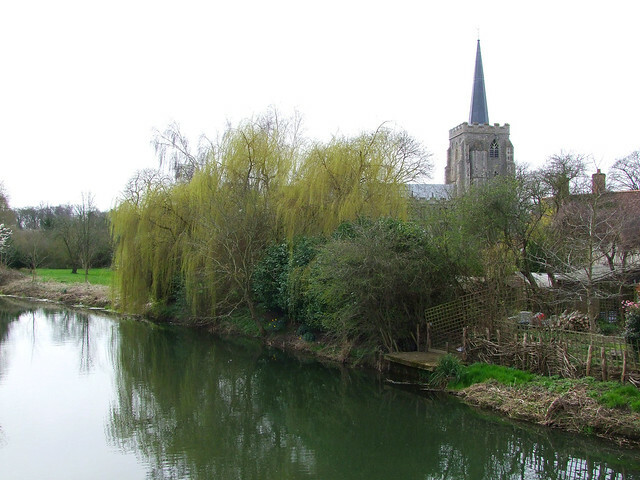 The River Gipping and its water meadows form a lovely barrier to development encroaching from the east, and on the far bank is the pleasing village of Bramford and its church of St Mary. St Mary sits down a little lane lined by 17th Century cottages, and you approach it from the north side. Of all the medieval parish churches in the Ipswich area, this one feels most like the traditional East Anglian medieval church that people expect to see when they come to Suffolk. First of all, there is the grandness, the great bulk of the 15th Century tower squatting like a bulldog, and then leavened by its elegant, recently restored spire (once a common feature of Suffolk churches). Along the battlements of the aisles, statues stand like guardians, mythical creatures, a bear, a monkey. Then there is the setting beside the river. And inside, this is a church full of the memories of the past of its community, and a sense of its use by that community today. St Mary has the feel of a classic country church, in a suburb that feels like a proper village. You step in through the open north porch into a wide, neat interior. The first thing that strikes you is Suffolk's only medieval stone rood screen. 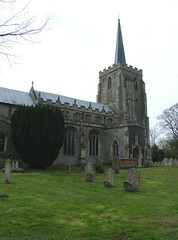 It dates from about 1300. There are several of these across the border in Essex, but it seems so unusual to see it here in an otherwise familiar medieval space. 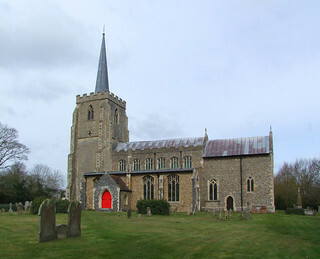 As James Bettley points out in the new Buildings of England: Suffolk, it is part of the architecture rather than the furnishing. 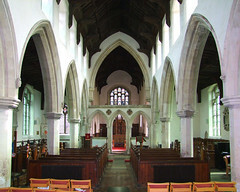 It gives an impression of the way medieval churches would enfold as a series of rooms before the 15th century passion for wide open congregational and processional spaces. You need a fairly vivid imagination to conjure up its medieval appearance, surmounted as it would be by a wooden loft and painted rood group. It would also have been clad in imagery, and buttressed by altars. 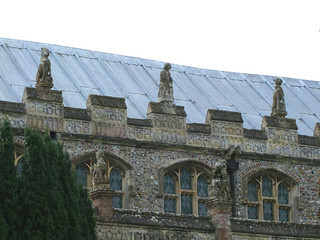 The quatrefoil holes were punched through at the end of the 19th century, when the chancel received its ritualist makeover. This was the second major Victorian restoration here; a drawing from the 1840s shows a nave full of box pews, all focused on a pulpit set in the middle of the south aisle. 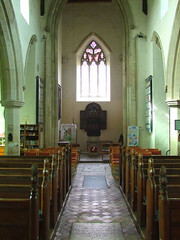 In the 1860s, this seating was replaced, and turned to face the altar at the east end. 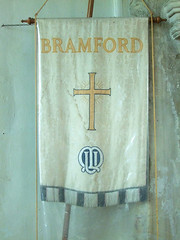 The pulpit was moved to its 'traditional' position. But the drawing reminds us that, for 200 years or so, it was the pulpit that was the focus of Anglican worship rather than the altar. It is also a reminder that the way our eyes are automatically drawn to the east end of a church would not have occured to our 18th century ancestors, who often blocked off the chancel for use as storage or a meeting room. It would have been above a poorbox - and indeed, it is still above a 20th Century money safe today. 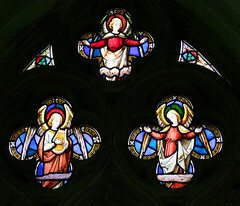 The chancel reredos by W D Caroe is a good example of turn-of-the-last-century seriousness. It sits beneath a familiarly stodgy window by Kempe & Co. 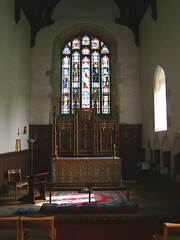 The bulky choir stalls, also by Caroe, have been removed from the chancel and placed in the south aisle. 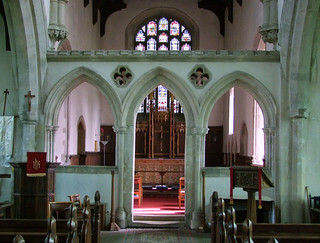 The chancel must have felt very cramped when they were sill in situ. 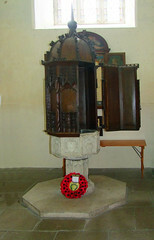 During the 19th century, the font was moved into the space beneath the tower to create a baptistery. The font is chiefly remarkable for its 16th century cover, which, like the one at Boxford, has doors which open outwards to give access to the water. 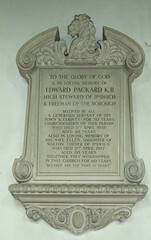 Recently, the large local factory of Packard & Sons closed, and the firm's elegant war memorial has been resited on the west wall of the tower behind the font, which provides a nice foil for the font but does make the war memorial difficult to photograph. 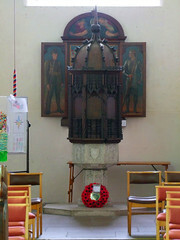 The parish war memorial is in the south aisle. 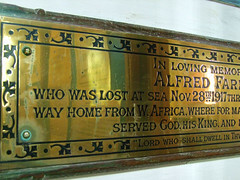 The Packards were a local family of some importance. 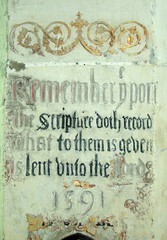 A number of 19th and 20th Century memorials in the church remark on their activities both here in Suffolk and out in the empire. 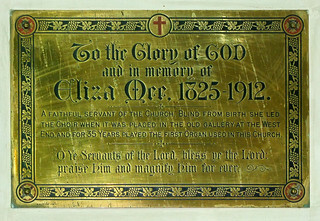 But best of all the memorials, I liked the little brass plaque to Eliza Mee, who died in 1912. It records that Blind from birth, she led the choir when it was placed in the old gallery, and for 35 years played the first organ used in this church.